Cook – What To Do With a Free Lobster | CookDrinkFeast! I was meandering through the Baltimore Farmer’s Market yesterday and noticed that Salt River Lobster had a trivia question posted. I stepped up and offered what I thought might be the correct answer. Moments later, I was walking away with a paper sack containing a live lobster. Fortunately, I had already purchased my fresh fruit and vegetables for the week so I could leave immediately. The seafood vendor was quick to offer advice, “If you’re squeamish about killing a lobster, put a shot of wine in the pot of wine in the pot and a shot of wine in you.” Appalled at the thought of wasting perfectly good wine on a crustacean that couldn’t appreciate it anyway, I told him that it was probably easier to kill a lobster than to eat it alive. 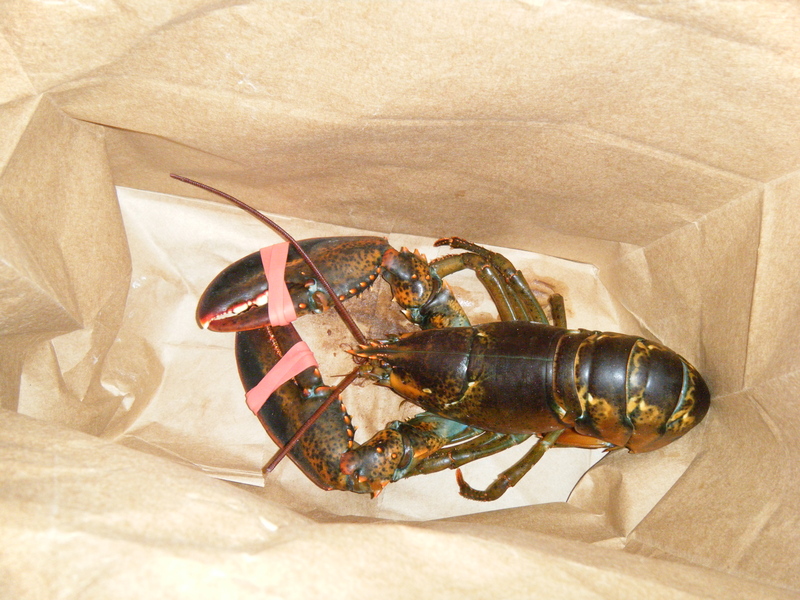 I took Howard home (what – doesn’t everyone name their lobsters? ), placed him in the refrigerator and left for work. I pondered how to prepare my free lobster. I thought of the lobster boils that New Englanders do on the beach with potatoes, corn on the cob, and fresh seawater. I actually had bought sweet Maryland corn and new potatoes at the market that day so I decided to do my own version. Pour clarified butter into a small bowl or ramekin over the lemon zest. Fill large pot two-thirds full with pater. Place on the stove to boil and add enough salt to make the water taste like seawater (about ¼ cup). When the water comes to a boil, reduce heat and add potatoes. Once the potatoes a cooked half way through, turn up the heat add the lobster, putting the head in the boiling water first, and the corn. Cover and boil for 10-13 minutes, taking care not to let the pot boil over. 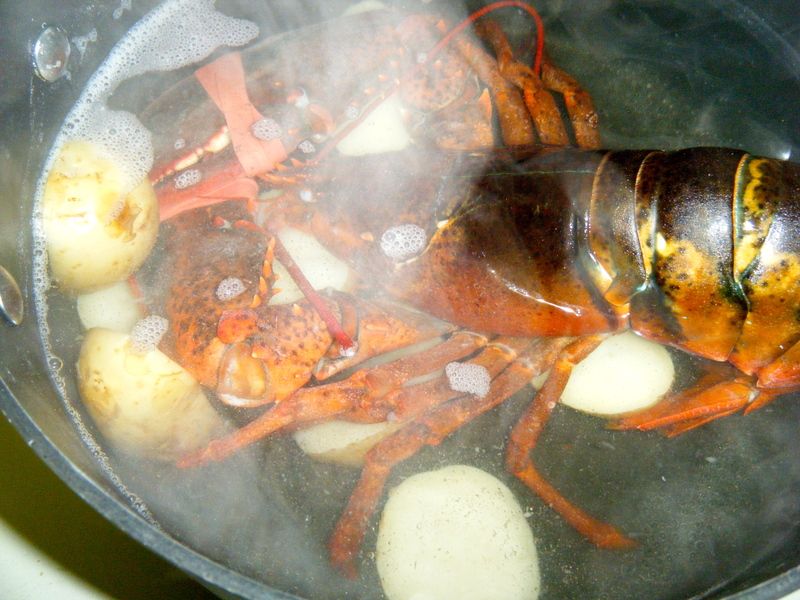 The lobster is cooked once the shell is bright red. Reheat clarified butter if necessary. 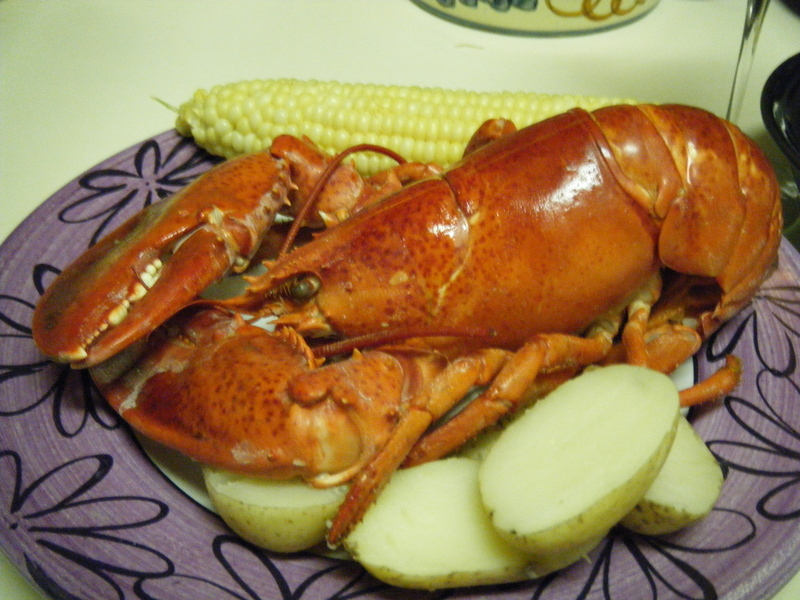 Arrange lobster, potatoes, and corn on a large plate and enjoy with clarified butter. Melt one stick of butter in a small saucepan over medium heat. Once the butter is melted, skim the white foam off of the top. Pour the melted butter into a glass measuring cup and place it in the refrigerator. Once the butter has re-solidified, take the solid butterfat off of the top — this is the clarified butter. Discard the milk solids at the bottom. Melt the desired amount for the lobster boil. This recipe makes more clarified butter than you need for the lobster boil; simply keep the rest in an airtight container in your refrigerator. Clarified butter is great for pan-searing steaks since it has a higher smoke point.